As an alternative to Japanese waterstones, one could also use diamond-coated sharpening devices. The diamonds are applied to an extremely flat, warping resistant and unbreakable base plate. In this way, diamond stones are extremely wear-resistant and stay flat. No more hollows, no more trueing. 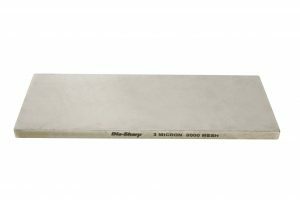 The high quality monocrystalline diamonds guarantee remarkable sharpening speed even when working the hardest tool steels like HM-, HSS- and PM steels. We recommend moistening diamond stones with water and grinding with little pressure. are especially wear-resistant and renowned for their perfectly flat surfaces. The DMT Dia Sharp bench stone (No. 705358) is recommended as a supplement to Japanese stones. It is also excellent for flattening the backs of plane or chisel blades or trueing waterstones.